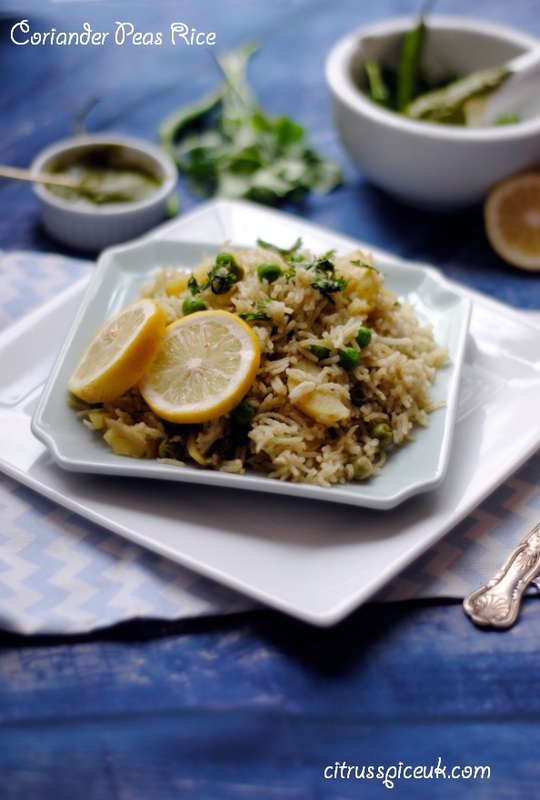 I love rice dishes and I am always looking for different ways to flavour my rice. 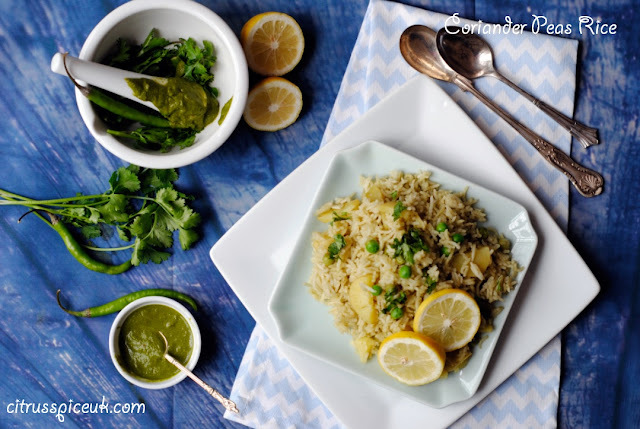 One of my recent favorite recipes is this coriander peas rice. The recipe requires very few ingredients, but believe me the aroma of fresh coriander is so pungent that, it is all that is required to make this rice flavoursome and delectable. I prepare this rice usually on a weeknight when I am in a hurry to get a meal on the table after work. For these occasions I tend to use my microwave for cooking to speed up the cooking process and also having the convenience of being able to cook something else whilst one dish is cooking in the microwave. Microwaves have come along a long way, my microwave oven is a combination one that cooks, grills and bakes but the newer Microwaves in the UK by Panasonic offer the turbo steam technology that preserves the delicious flavour, vitamins and nutrients of food. This is on my wish list when my microwave needs replacing. To make this rice dish in less than 20 minutes you can use a microwave , it can also be cooked on the stove top although the cooking time may differ. This microwave method is a foolproof way to make rice for those people who struggle to get delicious fluffy rice. 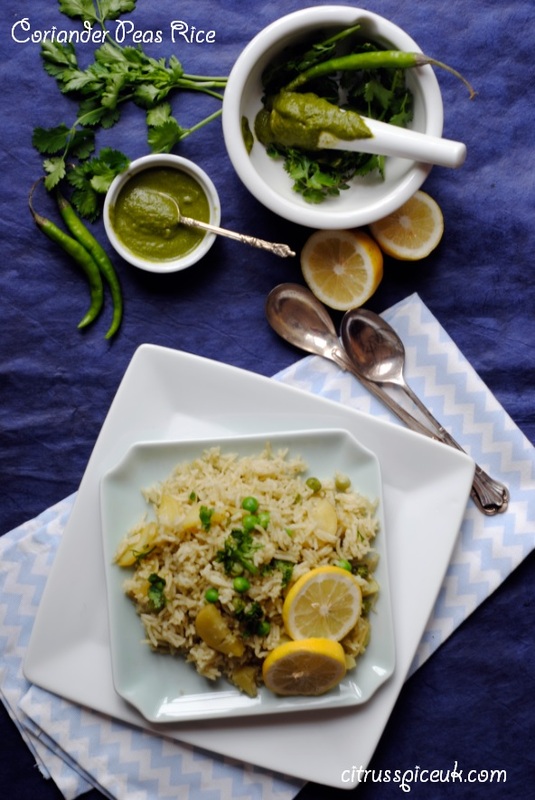 Aromatic coriander flavoured rice cooked with sweet tender peas. 2.Wash the rice and drain it. 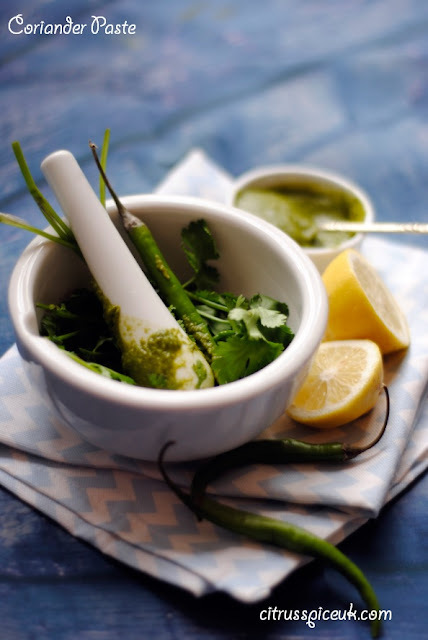 Add it to a large microwaveable bowl with a lid.Stir in the oil to coat the rice grains.3.Add the peas and potato slices, salt and two tablespoons of the coriander paste ( you can store any surplus in a jar in the fridge for later use) 4. Add 400 ml of water and stir all the ingredients. 5.Cover the bowl with the lid and place it in a microwave on high power for about 15 minutes to 18 minutes until all the water is absorbed and rice is cooked.6. Remove the bowl from the microwave and let the rice rest for 5 minutes after which open the lid and fluff up the rice with a fork.Transfer the rice to a serving dish and garnish with chopped coriander. You can serve the rice with any curry of your choice. This post is in collaboration with Panasonic. 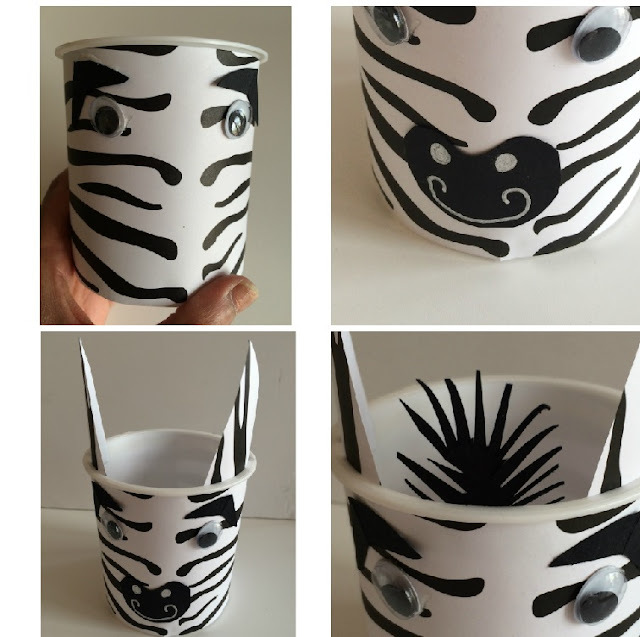 As part of the Bostik Bloggers challenge I have this month created a video post as well as a basic craft post using the contents that arrived in my Jungle themed craft box.You can see my Fathersday Zebra pot here. 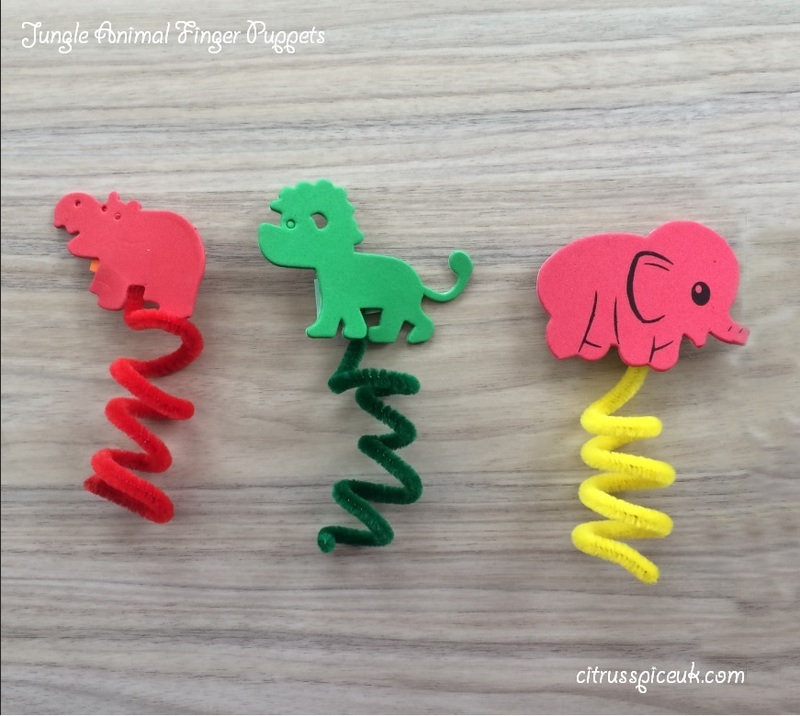 I made these finger puppets with my neice Little M and she loved playing with them. When I wanted to take a picture of them she arranged them on the table , when I asked her why the elephant was facing the other way she said that he not talking to the other animals!!!! 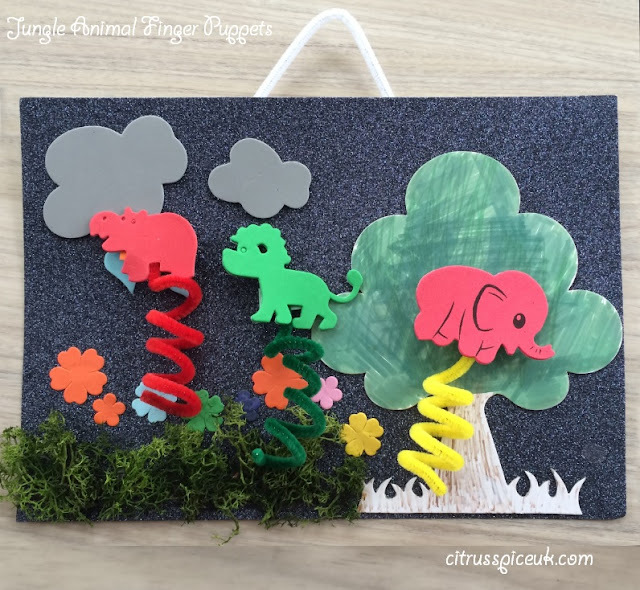 Little M also used some of the other craft things in the Jungle craft box to create a jungle picture which you can see below.She loved colouring the tree in and sticking the grass and making the sky on her picture. Being part of the Bostik 2016 bloggers with Tots 100 and Merrily Crafts, I was sent some craft items in a box to create this project. My top 10 cleaning tips. I like to keep my house clean and tidy and the best way to do it is to do the chores regularly and not allow housework to pile up. I always wash and wipe my sink each evening after I have done the dishes. I also make sure that all members of my family wipe down the shower door after showering. We have a rule that all laundry goes in the wash baskets and that all bins gets emptied every evening. All these little chores may sound laborious but it makes the weekly cleaning a breeze. I then do a thorough hovering, dusting and bathroom clean once a week which does not take very long as its maintenance cleaning rather than a full spring clean. Use vinegar and newspapers for polishing glass doors, windows and mirrors. 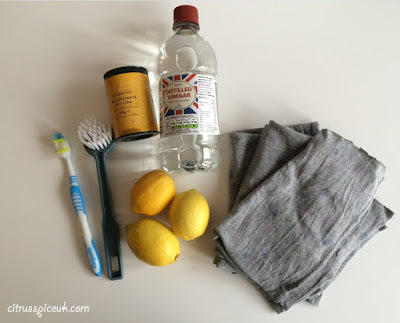 Make a paste from Bicarbonate of soda and water for cleaning fridge. It removes odours and it’s safe for the food. Place a lemon half in a bowl of water and put in microwave on high for 3 minutes. Remove the bowl and wipe clean the microwave. Use a tooth brushes to clean between hard to get areas in the bathroom and kitchen. Use white distilled vinegar to remove hard water and lime scale form kitchen sinks and taps and shower heads. Revive the grout on your bathroom tiles by applying a paste made from baking soda and bleach. Paste it on the grout and leave it for 15 minutes. Next using a toothbrush scrub the grout and rinse. You will have sparkling grout. To freshen up your mattress, you will need a box of baking soda and a few drops of essential oil. Add the oil to the baking soda and mix well. Sprinkle the scented baking soda all over your mattress and rub it in. Leave the baking soda mixture on the mattress for about 15 minutes after which hoover the baking soda off using a good quality hoover with a strong suction like the dyson. To remove carpet stains, mix two tablespoons of salt with white vinegar and rub on the stains and leave for 15 minutes. Hover the stain with a good powerful hoover. To remove hair from the carpet, use a wet rubber glove and rub the carpet with your wet rubber glove, the hairs will lift off easily. I have learnt over years that it just takes a few more minutes to put things back when I have used them instead of being lazy and leaving things out to tidy another day. Similarly it only takes a few more minutes to wash your cup after having coffee than leaving it in the kitchen sink for later. All these little efforts really make keeping the house neat and tidy and clean. 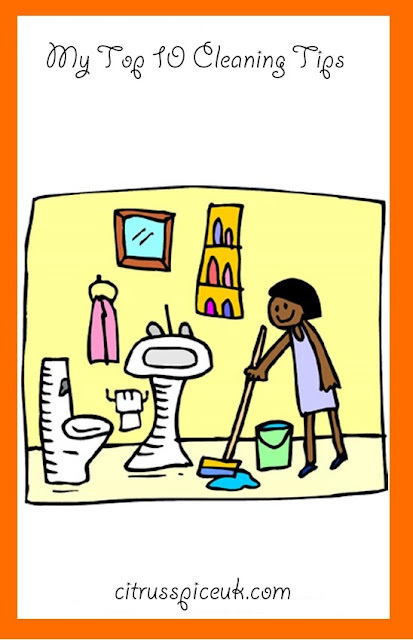 Do you have any great house cleaning tips that you can share with me??? I would like to thank Tesco for this collaboration. Its time of the month when my Bostik craft box pops through the letterbox. 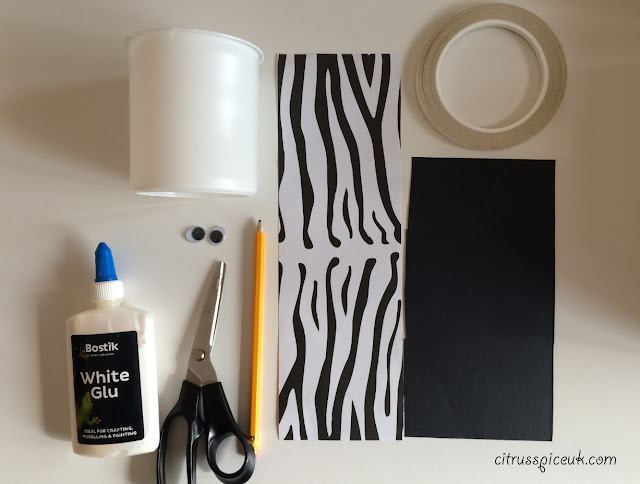 As you all know I always look forward to these as I always team up with my niece Little M to discover whats in the box and create a craft with it. This month's theme is jungle inspired with lots of animal print papers, fukyfoam, pipe cleaners and jungle animal shapes in the box. I invited Little M on Sunday afternoon so we could spend some time together and create a craft. As always we made a smoothie in my Froothie Optimum 9400. Little M loves choosing the fruits to put in the blender. 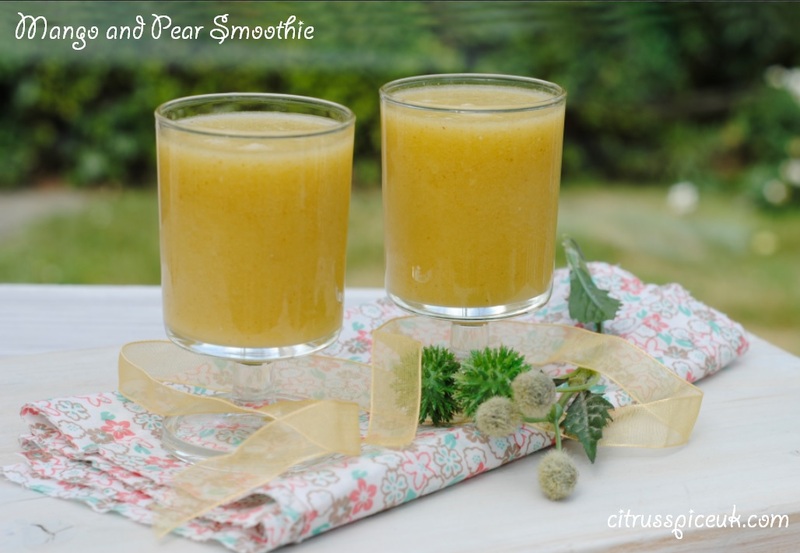 I had mangoes and juicy ripe pears in the fruit bowl so we made a lovely mango and pear smoothie, I filled up a couple of on the go bottles to take with us to the park together with some cookies to enjoy. The weather was lovely and we had a brilliant time in the park. Little M loves going on the swings although it tiring pushing her as her feet are still too short to reach the ground to swing herself!!! It got really hot so we decided to enjoy our smoothies and then head home. On the way home Little M and I chatted about what she did at school and how she likes her new room that was being decorated. We walked past some horses grazing in a nearby field and stopped to look at them. When we got home I let Little M look through the craft box and we decided we could make a Father's day present for her dad. Little M wanted to make horse!! My crafting talents are not that good so instead we chose some black zebra paper, some black paper and some stick on eyes from the box and decided to make a zebra pot for her dad that he could use as desk tidy. I had an empty plastic pot that was perfect to use for the project. You could use any cylindrical pot or wide mouthed jar for this project. 1 sheet Zebra print paper cut to fit around the pot. 1. 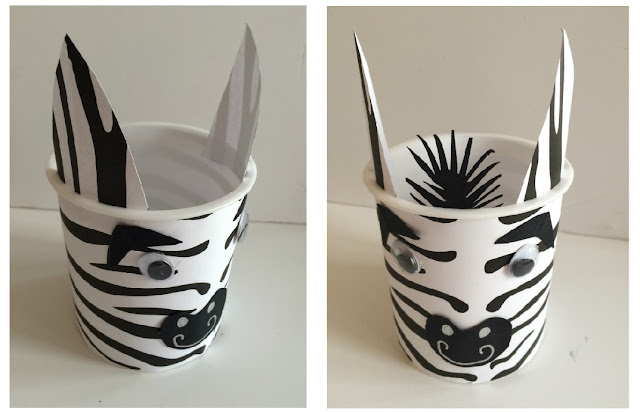 Cut the zebra paper so that it fits the circumference of the pot. 2. 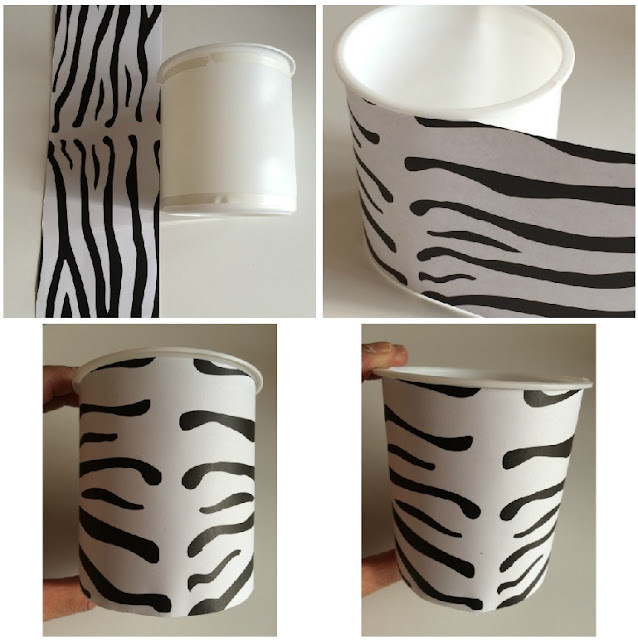 Put some double sided tape or you can use glue and stick the paper around the pot. 3. 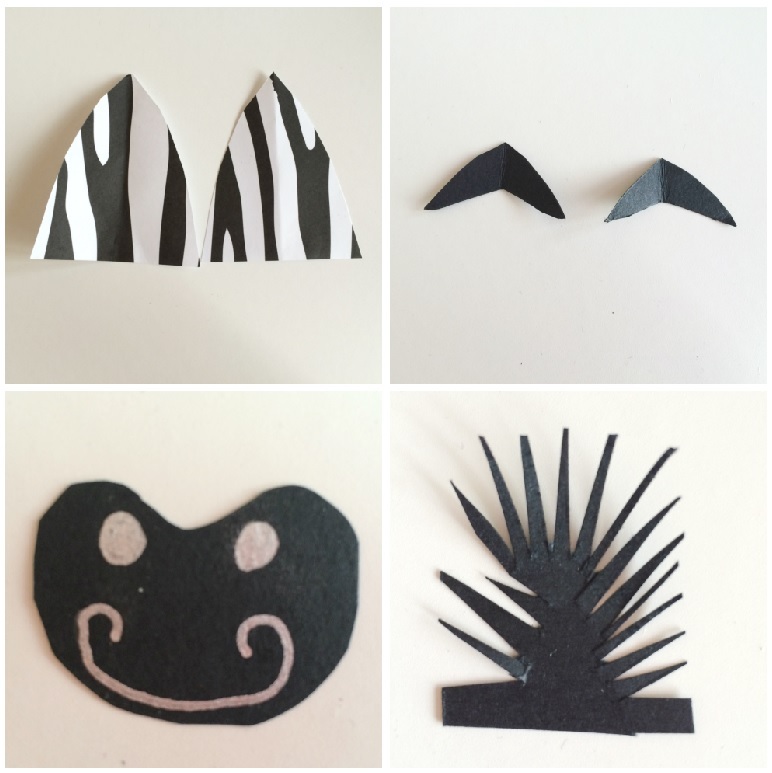 Cut out two triangular shaped ears from the zebra print paper. 4. From the black paper cut two v shaped eyebrows. 5. From the black paper cut a oval shape for the zebra's mouth and nostrils and using silver pen draw on the nostrils and mouth. 6. Cut a little spiky tuft of hair for the zebra from black card. 7. Using either glue or glue dots position the eyebrows and eyes and stick them onto the covered pot. 8. Position the zebra's mouth and stick it on. 9. Position the ears and stick them on to the inside of the pot so that zebra print is forward facing. The completed pot can be used as a desk tidy o to hold pencils, pens etc and it can also be used as gift pot filled with some treats for a lovely present. 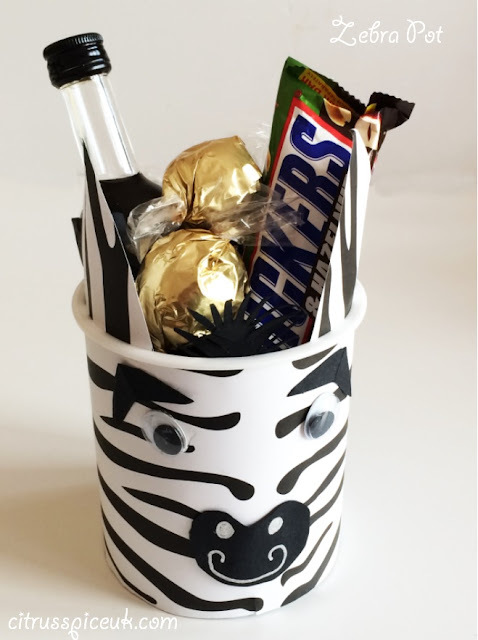 To create our father's day present we filled our pot with a snickers bar, some truffles and a small bottle of tipple. Tesco ~"Cake fit for the Queen"
Picture courtesy of Tesco Finest. 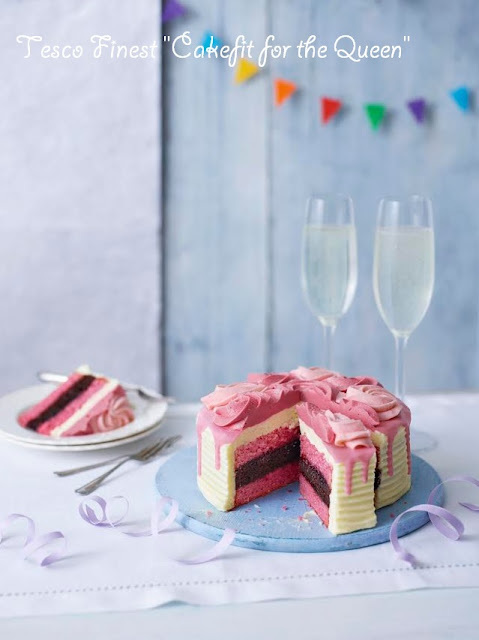 The whole nation is celebrating the queen's 90th Birthday and for this special occasion award winning master pâtissier and celebrity chef Eric Lanlard has teamed up with Tesco Finest to create the perfect birthday cake "Fit for the Queen" to celebrate the queens 90th Birthday. The cake is a three layered cake, one chocolate and two pink velvet layers filled with raspberry conserve and covered with Madagascan white chocolate buttercream and crowned with delicate prosecco flavoured buttercream roses. 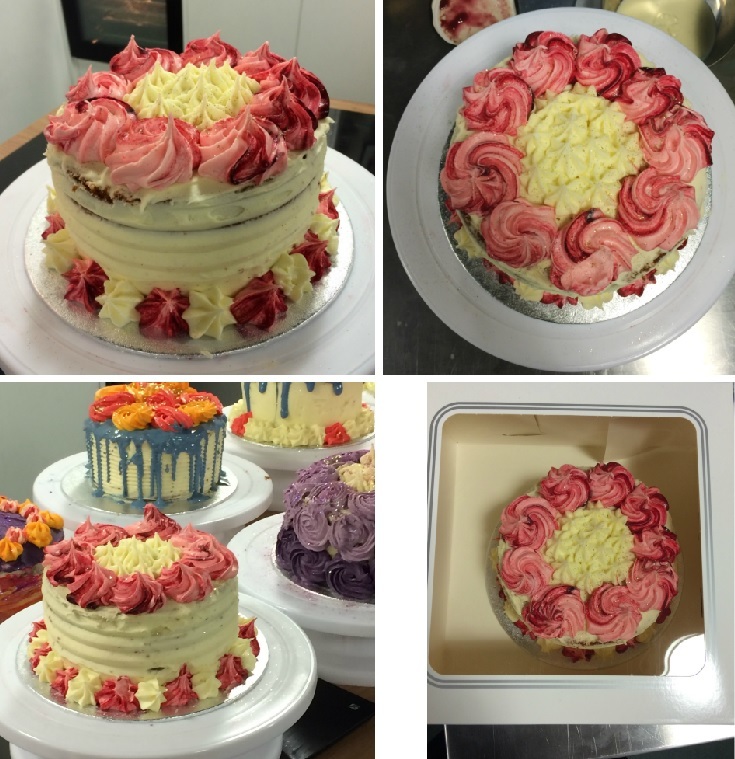 The final finishing touches are given by a sprinkle of edible lustre dust.The limited edition Tesco finest Cake Fit for a Queen is available in 532 stores nationwide from 3rd to 16th June 2016 at £10.00 and it serves 14. 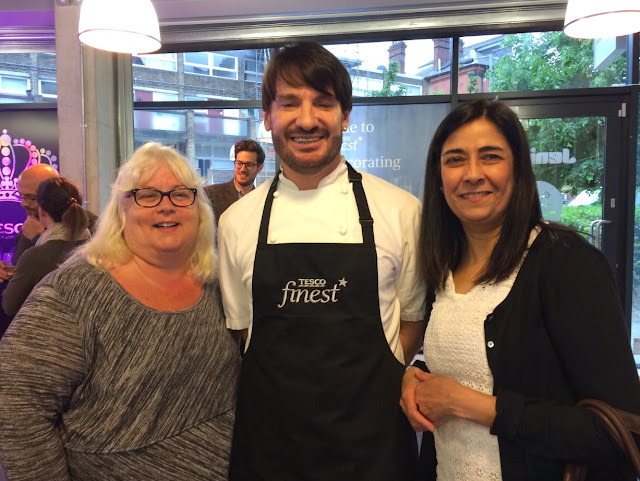 My friend Heidi and I were very fortunate to be invited at the first showing and tasting of this cake at a recent event hosted by Tesco Finest. 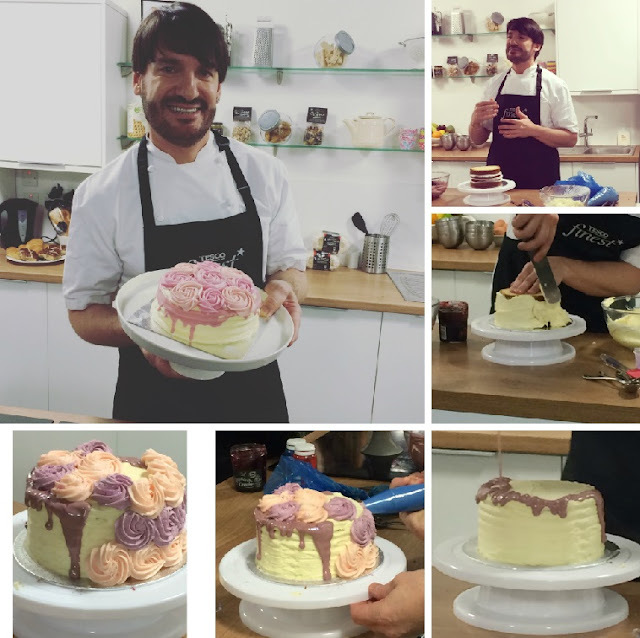 We were able to sample this delicious cake and then we were given a lesson in cake decorating by EricLanlard before being set free to let our creative juices run to create our own cakes to decorate and take home. Eric shared many useful cake decorating tips with us and it was a very creative session as Eric showed us two techniques of decoration, creating a drip effect on the cake followed by piping buttercream roses.You can see my creation below. 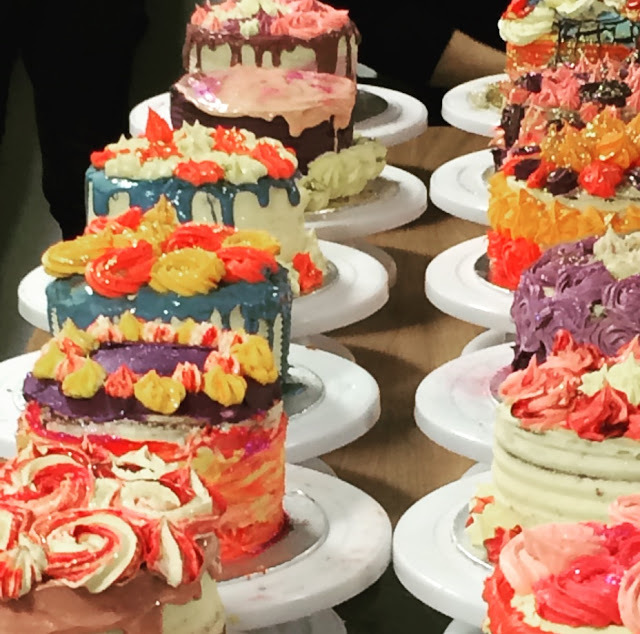 All the guests created some stunning cakes in a rainbow of colours. 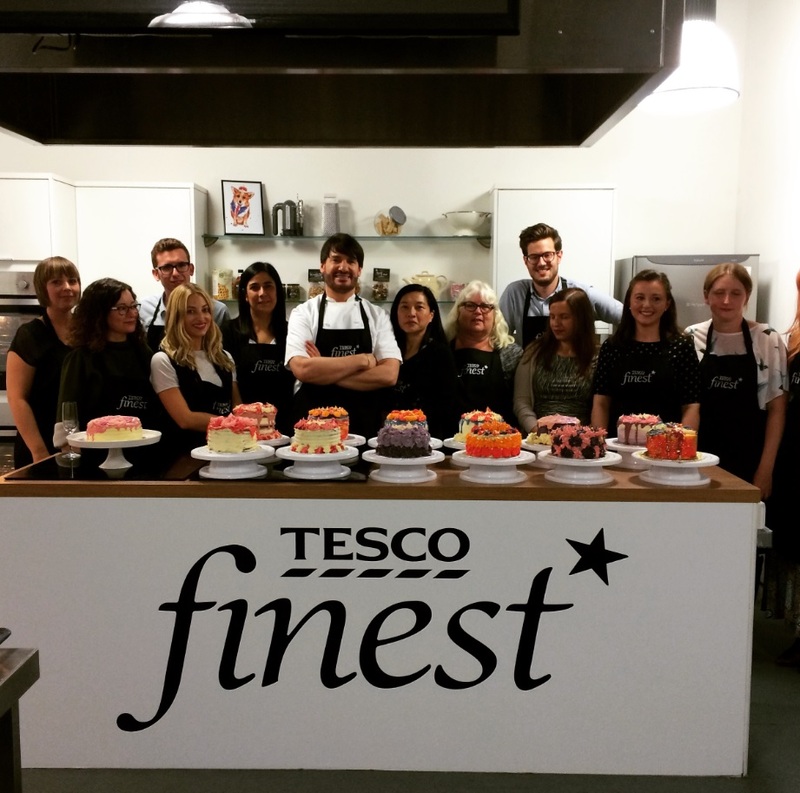 I would like to thank Tesco Finest for inviting me to this event. All views and opinions are of my own personal experience of the event. I am a really big fan of Great British Bake off and watch every episode when it's on. 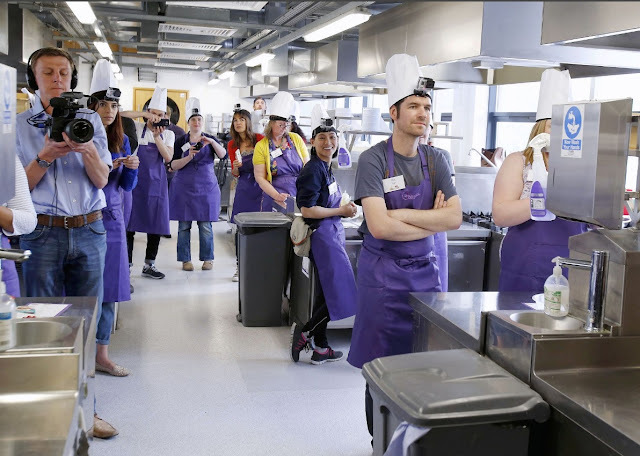 I really love the baking challenges that the participants partake in and secretly always wanted to be able to do something like that. 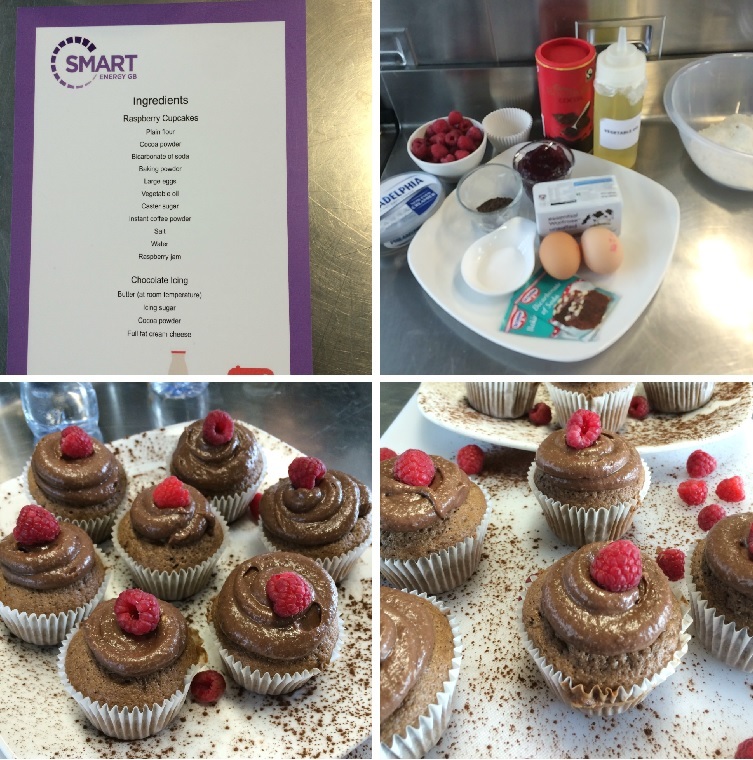 My wish was granted and I was recently invited to Estimation Nation Baking Challenge with Smart Energy GB at the Open Kitchen in Hoxton. So what are Smart meters, I can hear that question being asked.Smart meters are new generation gas and electricity meters that are replacing the old generation meters. They send automatic readings to your energy supplier and you can also monitor how much energy your gadgets is using with the help of the smart meters. Smart meters mean that there is no estimated bill, you get an exact reading of your energy usage and you can also budget your usage as it shows when, where and how much energy you are using from day to day on a portable hand held device. 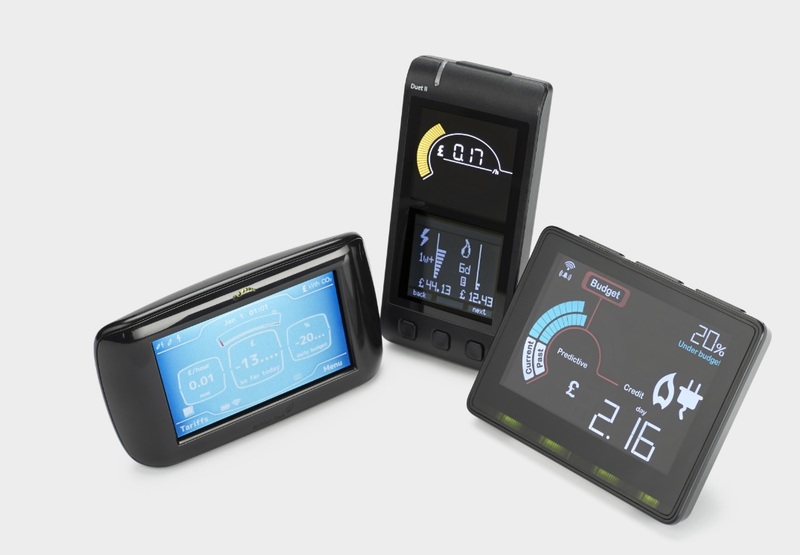 The advantages of the smart meters are that you no longer have to have a meter reading done, you are able to know exactly how much your bill is on a daily basis.The meters also work with prepayment plans and the smart meter will show you how much credit you have left and when you need to top up. Smart meters are being rolled out in England, Wales and Scotland and by 2020 everyone will have an option to choose to change to this system if they wish. It will not cost anything to you to make the change as your energy provider will provide and fit a smart meter and issue a handheld device as part of your energy plan. 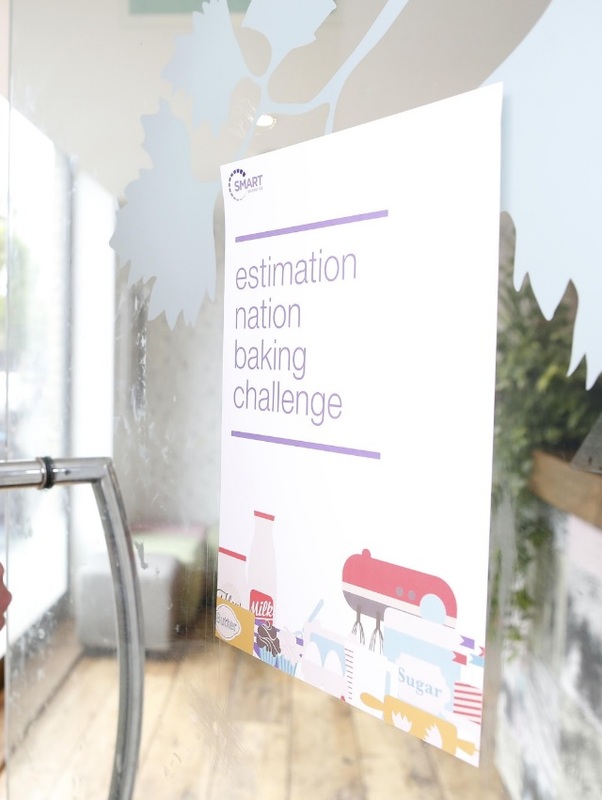 Now that I have told you all about the smart meters I am going to explain what our estimation nation baking challenge was all about. 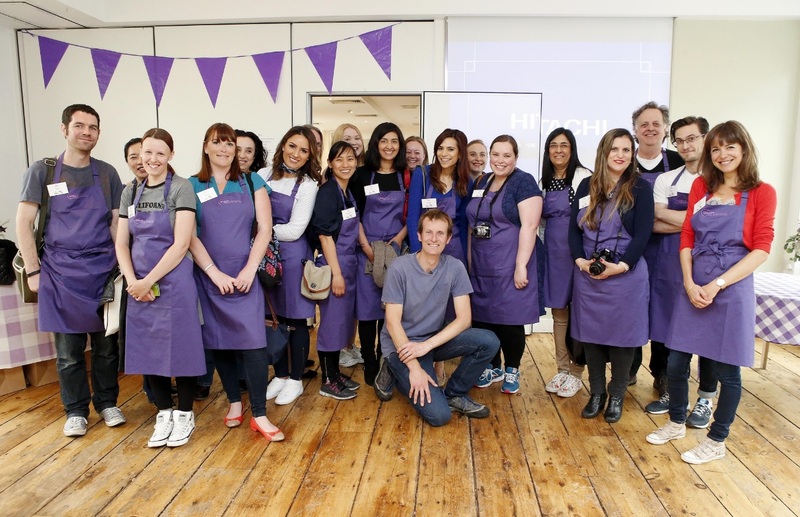 We were set up in pairs and had to bake two recipes, before we could do that we were fitted with Gopro cameras to film the whole baking challenge. It was really hard to keep them on our heads while baking and they did not look very flattering. 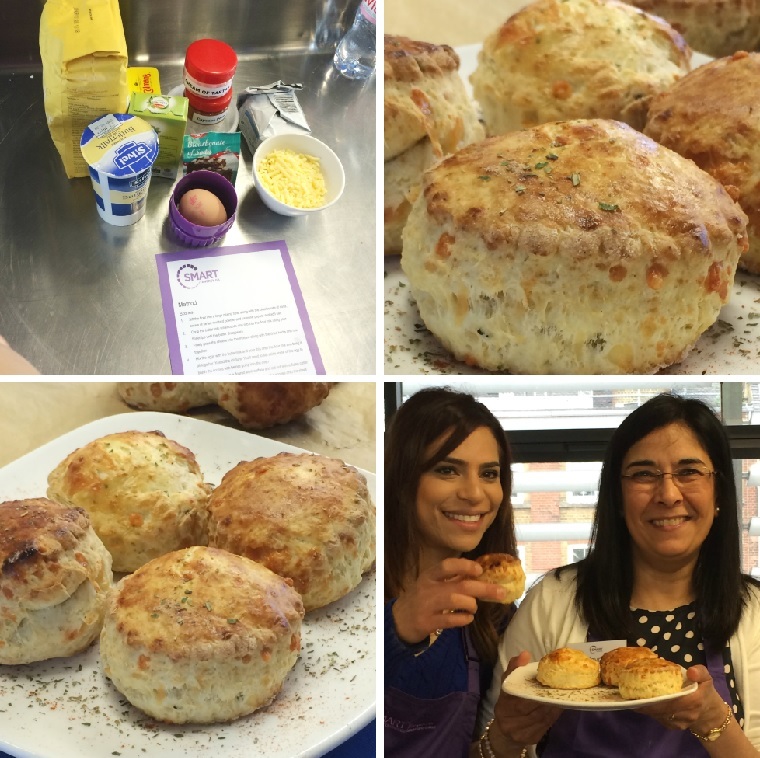 The first technical challenge was to make Raspberry cupcakes and the second was to make Cheesy herby savoury scones., You may think that this was an easy challenge but wait for it there was a major twist exactly like Bake off style!!! We were given the ingredients and a recipe card, but the card had all the quantity measurements, the baking temperature and baking times missing. 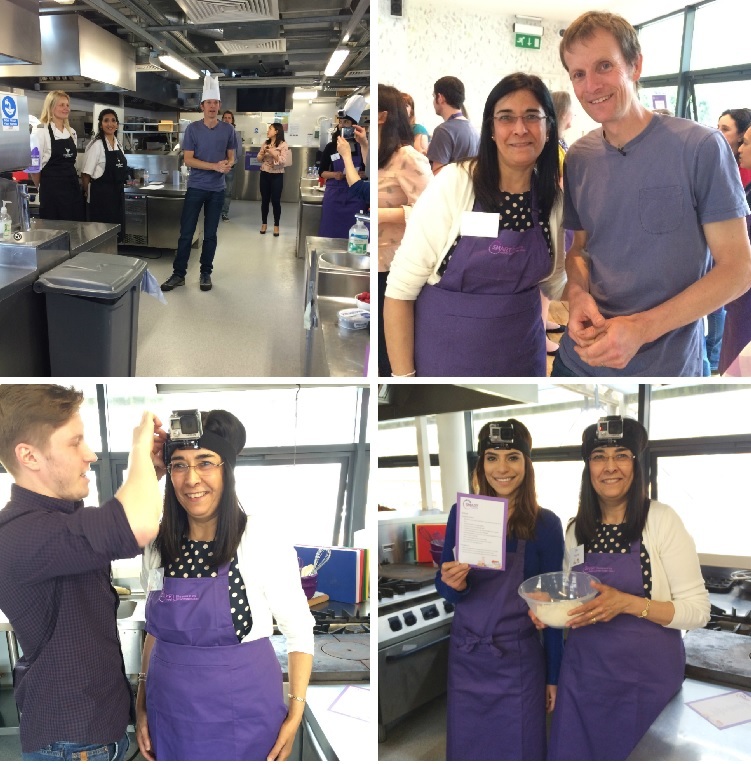 Our task was to estimate all the ingredients and baking times and we were not given any measuring or weighing tools. Sarah my partner and I have both baked before so we had a vague idea of quantities.We worked really well together as a team right from the guesstimation of the ingredients to the mixing, baking and finally the styling and presentation. 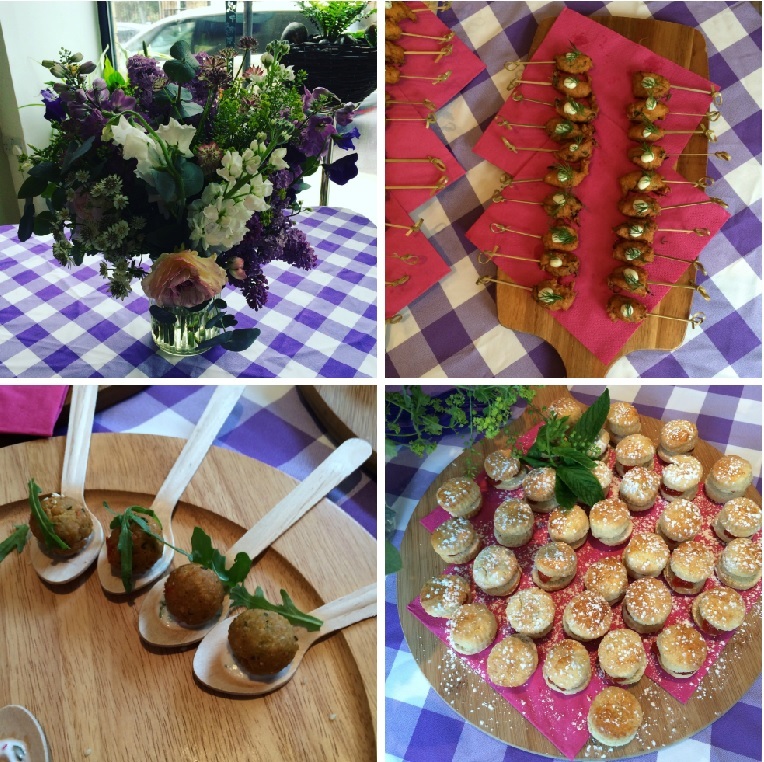 We were extremely pleased with our finished creations, not only did they turn out well, they tasted great too. 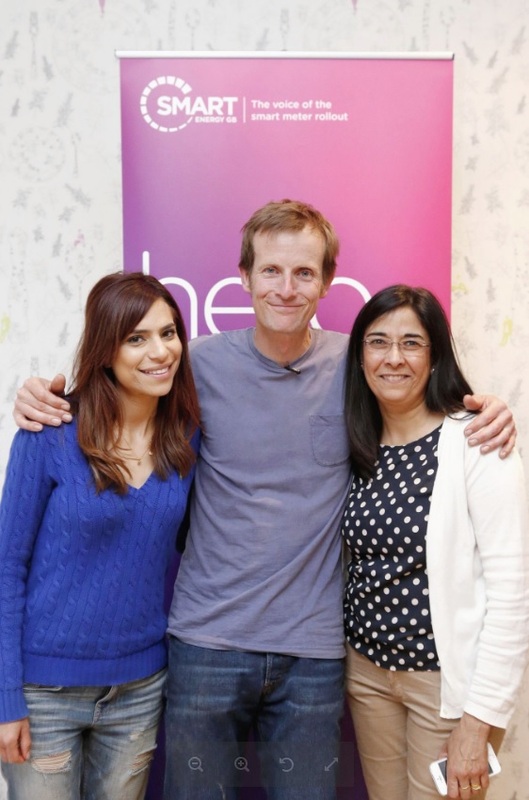 The bakes were judged by Ian Cummings who was a runner up of the Great British Bake off last year. The evening ended with some hot canapes and prize givings. There were prizes for the best bake and the worst, needless to say we won neither. Being competitive I was pretty confident that we did well, I am sure I would not have wanted to win the worst bake prize !!! !It was a fun and exciting participating in the Estimation Nation baking challenge. I was invited by Smart Energy GB to participate in this challenge. All views and opinions are of my own personal experience. The two group photos and the bottom photo was used with permission from O'connor Photography.